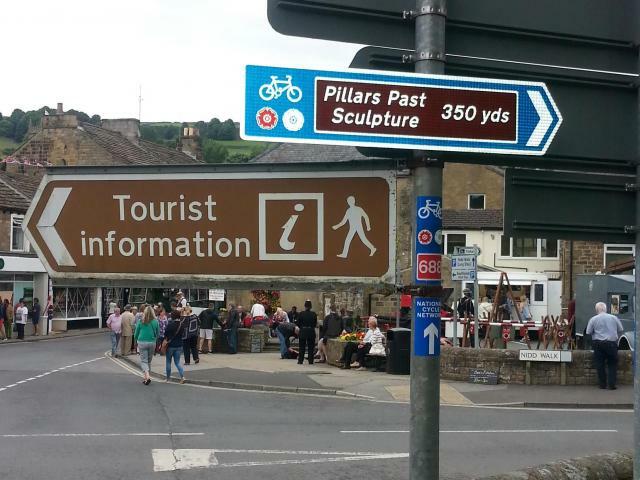 Once you have safely descended Greenhow Hill, the route goes straight on over the bridge and up the High Street in Pateley Bridge. However, for those of you who are interested in artwork, do take a short detour after the bridge (turn right as signed) to see the finely crafted Pillars Past artwork by local sculptor Jo Hayton. But, please remember that you need to return the way you came to see more of the town and continue on the Way of the Roses route up the High Street. There is NO ACCESS for cyclists beyond the Pillars Past artwork only private residences. ← Another ‘Way in a Day’!